As Scandal begins its final descent, we figured Shonda Rhimes would look to dangle our hearts over several cliffs on multiple occasions, starting with last night’s mid-season premiere, which did its best and worst to convince us to feel sad. The series previously left us with Papa Pope holding Quinn captive and threatening to kill her, and with Olivia Pope calling her father’s bluff. 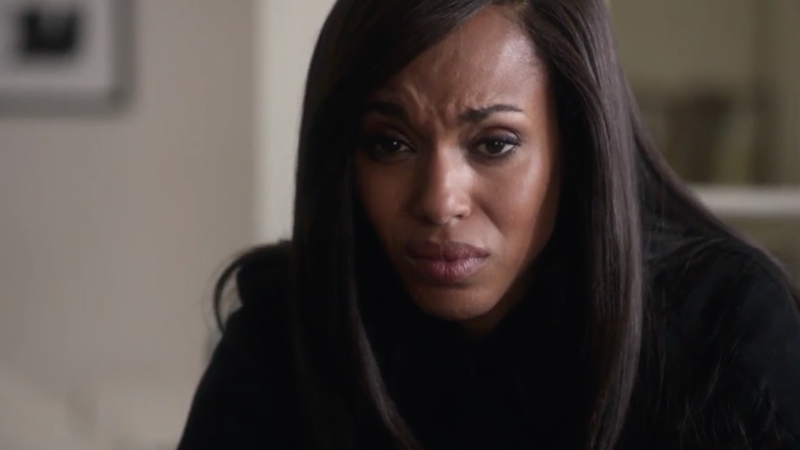 There was a gunshot and then a shocked expression from Liv (see screenshot above). Now we’re back and Quinn is allegedly dead. WINK! The episode opens with Papa Pope setting a car trunk ablaze and then leaving like Angela Bassett in Waiting to Exhale. Investigators later “identify” the “remains” found in the car as “Quinn,” despite all the clues we’ve picked up as life-long television viewers that help us recognize when a person is not dead, including the absence of a dead body that looks like the person who’s said to be dead. Huck is the only person smart enough to be suspicious and pick up on Olivia’s proximity to the event of Quinn’s alleged demise. Since next week’s episode focuses on “what happened in the basement” with Quinn and Papa Pope, there’s more to this story. There’s also a chance Shonda is running reverse psychology. Did she know we would think we knew Quinn isn’t dead? Does she know we know she knows? Is this me coping? I don’t think so. I’m pretty sure Quinn is not dead.